Featured Project - Dona Larsen Park - McAlvain Companies, Inc.
For the past couple years, McAlvain Design Build has used the catch phrase “Discover the McAlvain Advantage” within its marketing efforts. The Dona Larsen Park project, completed for Boise State and the State of Idaho Division of Public Works, showcases these Advantages. It all starts with our approach to the design/build process and our focus within the pre-construction phase which is to maximize the program based on the available budget of our clients. Our goal is to exceed all expectations and in the end provide our customers with a facility that the entire project team – from the Owner, the D/B contractor, the architect, engineers, subcontractors, and end users – will be proud of. With the Dona Larsen Park project, the initial program estimates for the state-of-the-art NCAA Track & Field facility were initially $800,000 over the State’s budget. Through Value Engineering, McAlvain was not only able to bring the budget down but give additional scope. At the beginning of the project, it was questionable if the program allowed for the Women’s Softball field. 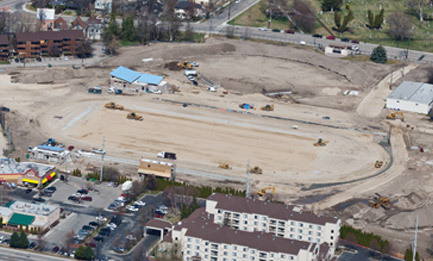 When all was said and done, the softball field was included as well as a pressbox for the field that was not originally in the plans. The project was designed and constructed on an aggressive schedule and completed in time for fall competition. 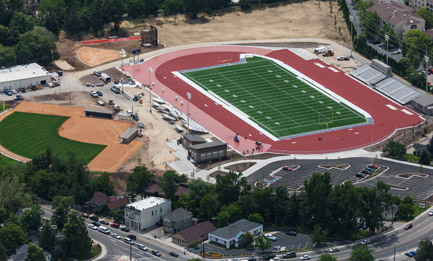 Project details include: Track & Field facility for Boise State University was developed to meet full compliance with NCAA rules for hosting intercollegiate track and field competitions. 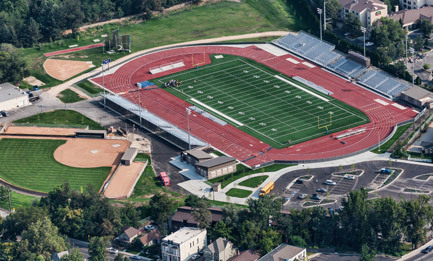 The facility includes an 8-lane track, football field, press box, 5,000 seats, scoreboards, women’s softball field, restrooms, PA system, field lights and other amenities as needed. 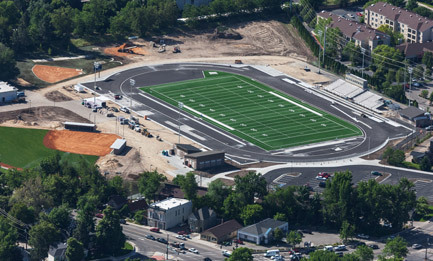 In addition to Track & Field, the facility will host Boise State Women’s Softball and Boise School District High School football games. With existing end zone bleachers at Bronco Stadium being moved over to the Dona Larsen Park, this project includes construction of new expanded seating in the north and south end zones at the stadium. The south end zone bleacher system connects the east and west concourse completing the horseshoe. The expansion increases stadium capacity from 33,500 to 37,000 seats. “McAlvain was able to deliver a substantial program with a limited budget. 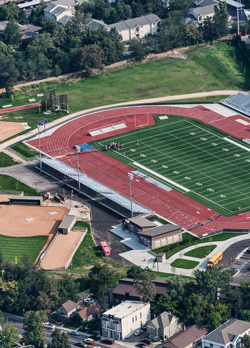 In all aspects of their work, McAlvain demonstrated remarkable leadership, professionalism and an excellent knowledge and skill in sports facility construction.” – Barry Miller, Senior Project Manager, State of Idaho Division of Public Works.